Oyster Mushroom Kit from Mushroom Adventures. Grows mushrooms at home. 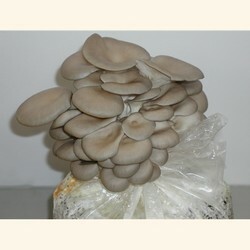 These are easy and fun to grow oyster mushroom kits. They taste good and grow several crops of mushrooms over time. Pricing and outer box options maybe viewed below. Shipping charges are calculated at time of check out. This is a wonderful eating mushroom, which grows fast and fruits several crops of mushrooms. The mushrooms are silver gray in color, if ample light is present. They can also be off white in color, if grown in dim light. The caps of this mushroom are of medium size and lend themselves to all methods of cooking. Oyster mushrooms can be cooked in many ways, Sauteed to BBQ, stir-fried or battered and cook like tempura. They are easy to grow and store well after harvesting in the refrigerator. All mushroom kits can to some degree attract small fungus gnats this is normal. Shipping charges are calculated at time of check out. Kit Instructions: See Oyster Mushroom Kit Instructions.